Dr. Nkrumah wrote in his diary: "Things will not go well for Ghana"
An American, New York businessman Robert Shulman is battling Vincent Mbirika, a Kenyan-born, New York-based scholar and amateur investigator, who doggedly tracked down and succeeded in retrieving the diary from the American who had it in his possession for many years. The Kenyan, who describes himself as Africa’s “Indiana Jones” has convinced the Eastern District Court of Pennsylvania in the US that the diary rightly belongs to Ghana and to the Nkrumah family and should be returned to Africa. The judge ruled that the diary, which offers a rare look into the public and personal life of the great Pan-Africanist, was among the possessions of Dr Nkrumah when he died in Romania in 1972. The judge has ordered that the diary should be handed over to the Ghanaian ambassador in Washington for onward conveyance to Ghana. 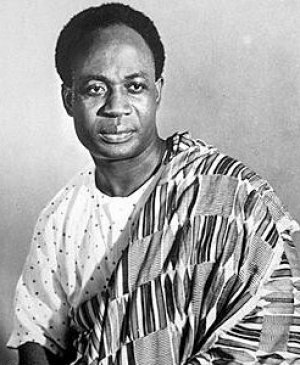 Mbirika invited Sadick Abubakar, a Ghanaian living in Washington and a director of the United African Congress, a US advocacy group for African expatriates, to help in contacting Nkrumah’s relatives back home to provide the necessary backings. The diary has travelled around the world over the last 40 years from Ghana to Guinea to Romania and America. Shulman has been keeping the diary for many years now and with the latest ruling Ghanaians will now have a feel of what their founding father wrote about his career. One entry, from 1966, the year Nkrumah was ousted by the military, mentions the purchase of military equipment from the Soviet Union. In another entry, from 1968, when Nkrumah was living in Guinea, the former president instructs his wife, Fathia, to “take care” of their children – Gamal Gorkeh, Sekou, and Samia (who is now an MP in Ghana and chairperson of the Convention People’s Party founded by her father). Possibly the most compelling entry in the diary (which is about the size of a small paperback and has a bookmark with the colours of Ghana’s flag stuffed in its pages), is one where Nkrumah, who had been Ghana’s head of state since independence from Britain in 1957, reflects on the abrupt end of his presidency. It makes clear that Nkrumah was worried about Ghana and Africa’s future. He wrote: “Things will not go well for Ghana” and said his “vision” for Ghana would now be “lost”. It is with deep sorrow and sadness that we announce the sudden death of Justin Marasa which occurred in Baltimore, Maryland on April 9th, 2012. 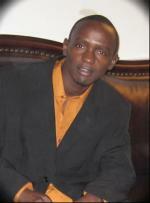 The late was a dear brother to Dr. Bernard Marasa of Baltimore, Maryland and brother-in-law to Nancy Angwenyi and loving uncle to Watson Marasa and Janelle Marasa of Baltimore, MD. He was a beloved father to Alexander Leland Marasa. Family, relatives and friends are meeting daily at Dr. Benard Marasa’s residence: 5205 Saybrook Rd, Baltimore, MD 21206 for prayers starting at 6pm sharp. Friends and relatives are encouraged to pray for Dr. Marasa’s Family. The memorial service and main fundraising is scheduled for Saturday April 21st, 2012 at 9600 Pulaski Park Dr, Suite 115, Middle River, Maryland 21220 starting at 4:00pm. Meanwhile, IT contracts for government websites, electronic registries, and other large projects are typically conceived by NGOs or donors and carried out by contractors who may be remote from the specific needs of workers at the front lines. “You have people thinking at 30,000 feet: ‘Let’s do websites for every government ministry,'” Jackson Hungu, CHAI’s country director, told me over dinner in Nairobi. That’s good, he says, but it may not meet the needs on the ground: “Have we gone to that pharmacist and asked, ‘Look, what do you do? You are the one who meets the patient and feels the pain.’ Have we understood it thoroughly from that guy’s point of view? Or are we building something so donors can say, ‘Oh, we are online’?” Successful national technology strategies, he argues, require people like the Strathmore students, who have the code-writing chops, can readily work with the people who need to use the technology, and are likely to remain in Kenya to sustain the effort. If you travel back up a rutted dirt road from Kibera and turn right on the Ngong Road, just past the Uchumi Hypermarket, you’ll see a five-story office building completed in 2009. From the patio ringing the top floor, a haze from diesel fumes and the cooking fires of Kibera’s shacks is visible just beyond the crest of a hill. But step inside, and it feels as if you’ve been transported to a Silicon Valley startup. Dozens of twentysomethings toil away on laptops; a few blow off steam at a foosball table; Pete’s coffee bar (not to be confused with Peet’s of the United States) doles out cappuccinos, milk shakes, and slabs of banana bread. This is a business incubator called iHub, the fruit of a homegrown information technology culture that had its coming-of-age moment in December 2007. That month, ethnic violence broke out after a disputed presidential election; at least 1,100 people died and 300,000 were displaced. Ory Okolloh, a human-rights activist, put out a call to Kenya’s loosely knit blogging and technology community to help report on the fighting (see “Frustrated Innovation“). Several people responded, including Erik Hersman, Juliana Rotich, and David Kobia. In 48 hours, Kobia had written the first draft of an incident-reporting platform called Ushahidi, the Swahili word for “testimony.” Now any Kenyan could send in an eyewitness report by text message, and it would be reviewed and then posted on an online map. Ushahidi has since been used widely, in countries including Haiti, South Africa, Russia, and the United States (where it helped map flood-related problems on the Missouri River). 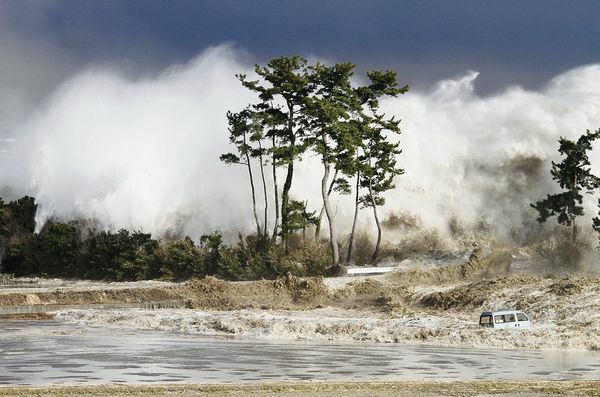 Kenya has issued a Tsunami alert after massive quake hits Indonesia, Minister Esther Murugi has announced. Schools around the coast will be closed to avoid a stampede on ferries. Hospitals have also been alerted to be on standby. Updates will continue to be issued as developments arise. Another victim of human-trafficking, who was lured to Saudi Arabia with promises of a well-paying job, returned home early this week with tales of tribulations and suffering. Ms Jane Wanjiku narrated to the Nation how her Saudi Arabian boss turned her into a slave by forcing her to work for long hours without a break and subjecting her to inhuman treatment. Ms Wanjiku first heard of well-paying job opportunities in Saudi Arabia through a friend, who introduced her to agents in Nairobi. A deal was struck for Ms Wanjiku to take up a job as a caretaker for a disabled child. Two weeks after leaving Nairobi for Saudi last December 28, she found the conditions unbearable but her boss rejected her plea to return home on grounds that she had to repay the expenses they had incurred on her. “I wanted to come back because it was too much for me but they refused. I spoke to the agent and they took me to another home”, the 47-year-old told the Nation on Monday. Although she thought the move would bring reprieve, it turned out to be a plunge from the frying pan to the fire. She said her hopes crushed upon realisation that food was laced with drugs just like in her previous work place. Matters became even worse because she was forced to eat the food. “They urged me to eat, saying it was important for my health but I realised the food was laced with drugs. I had no option and ate a little food,” the mother of four said. She claimed her food was always served from a different tray which made her suspect a sinister motive. She then sought the help of a local woman for interpretations of Arabic, which her employer’s family spoke and realised they intended to kill her. “The woman told me they wanted to kill me because I was too inquisitive. They thought I would narrate my tribulations and that could possibly spoil their market,” Ms Wanjiku claimed. It is for that reason that she believes her life is still in danger after unknown people allegedly trailed her on Sunday upon arrival back to Kenya. But when contacted, Al-Kaki Enterprises & Travel manager Julius Kimemia (the agents recruiting the domestic workers) denied the allegations, saying she was flown back to the country purely on medical grounds. “I talked to the woman yesterday (Sunday) when she was still at the airport and she said she was unwell. I don’t have any information regarding those claims, but we will look into them,” Mr Kimemia told the Nation on phone. But even as Mr Kimemia insisted Ms Wanjiku was never assaulted, she revealed bruises and injuries on her body to indicate that she had been tortured. 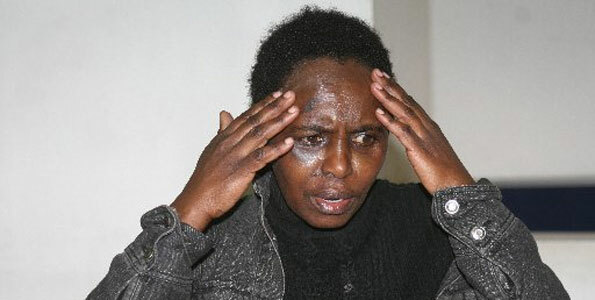 Ms Wanjiku claimed to have become unconscious for several hours one day after being forced to eat food laced with drugs only to wake up with pain in her stomach. She said her health has deteriorated since. But the worst experience for Ms Wanjiku was when she was locked up in a roof-less room without food for three days. “That is when I contemplated committing suicide. I prayed to God for it was all I could do,” she said. She jumped through a small window into the next building from where police took her to hospital. It was while at the hospital that the host family coordinated her return journey. Judith (right) escorted by Customs personnel to a courtroom yesterday. KOTA KINABALU: The High Court here yesterday postponed the trial of a Kenyan woman charged with trafficking in 3,747.63 grams of syabu as she would be undergoing surgery at a hospital here. Justice Dato’ Abdul Rahman Sebli deferred the trial of Judith Achieng Odoyo, 30, to June 27 to 29 and July 16 to 18, this year upon the request of her assigned counsel Ram Singh. When applying for postponement, Singh informed the court that Odoyo was due to be admitted into the Likas Women’s and Children’s Hospital to undergo a surgery. “She has been diagnosed with fibroid and her operation is due tomorrow (today),” Singh said, adding that the accused should be admitted before 12.30pm to enable the hospital authority to prepare her for the surgery. Deputy public prosecutor Mohd Radzi Shah Abdul Razak told the court that he had no objection to the application to enable the accused to be admitted into the hospital. The court however issued an order for Singh to tender a letter from the hospital to confirm the matter. Singh duly tendered the letter confirming that the accused needed to be admitted to the hospital as she had been planned for elective surgery (today) to the court during its proceedings in the afternoon. Odoyo from Kenya, allegedly trafficked the drug at the passenger examination special unit at Terminal 1 of the Kota Kinabalu International Airport (KKIA) about 8.45am on September 1. She is charged under Section 39B (1) (a) of the Dangerous Drugs Act 1952 which provides for the mandatory death sentence by hanging upon conviction. The prosecution would be calling 10 witnesses to testify against Odoyo during the trial. The accused has been remanded in custody ever since the date of her arrest since drug trafficking is a non-bailable offence. Exasperated by a half hour of gridlock in downtown Nairobi last month, a bus driver jumped the median and headed toward oncoming traffic. As cars, trucks and hawkers jostled for space, he raced ahead, almost colliding with a motorcycle courier, before pulling back into his lane. It’s a frequent scene in the Kenyan capital, where commuters compete with trucks ferrying cargo between East Africa’s biggest port of Mombasa, on the Kenyan coast, and landlocked neighbors Uganda and Rwanda, all on a road that runs through the middle of Nairobi. To end the jams, Kenya is building more roads than it has since independence half a century ago as the government forecasts the economic growth rate will double over the next two decades, to about 10 percent. At least 80 billion shillings ($970 million) is being spent over five years on more than 500 kilometers of new roads and on widening existing ones. That may boost profits for the East African franchise ofCoca-Cola Co. (KO), which is spending $62 million increasing capacity in Kenya; Del Monte Fresh Produce Inc.’s local unit that produces and processes fruit from farms; and Unilever (UNA), whose Kenyan tea plantations turn out 30,000 tons a year. The government’s growing ability to borrow to pay for road and energy projects is fueling the country’s debt market, with almost $1.4 billion infrastructure bonds sold since the first such sale in 2009, said Razia Khan, head of African research for Standard Chartered Bank in London. Kenya also is securing a $600 million loan, arranged byCitigroup Inc. (C), South Africa’s Standard Bank Group Ltd. (SBK) and London-based Standard Chartered Plc (STAN), to finance roadway, energy and irrigation projects in the fiscal year through June. Kenya’s B+/B rating was affirmed by Standard & Poor’s in December, with a stable outlook. The central bank’s fight against inflation has pushed up yields: The yield on the five-year benchmark bond rose to 13.9 percent at an auction on August 24, the highest since at least May 2006, compared with 12.5 percent at the previous sale on June 22. Two-year borrowing costs climbed to 22.8 percent on Nov. 23, from 16.5 percent the month earlier, according to central bank data. A broadening base of taxpayers and greater efforts to tackle tax evasion have helped boost state revenue. Expenditure on highway, railway and power projects have almost doubled in the past three years, to 221 billion shillings in 2011-2012. While Kenya is starting to show it can spend borrowed money effectively, in the past funds intended for infrastructure have sometimes been lost to corruption, Mercer said. The World Bank de-barred two companies and a business owner in 2003 after an investigation in Kenya revealed a former World Bank employee and government official were paid kickbacks in a project funded by the Washington-based lender to lay down roads, according to a statement. Kenya is among the world’s 30-most graft-prone countries, alongside Zimbabwe and Paraguay, according to Transparency International’s latest corruption perception index. The flagship road project is the 27 billion-shilling upgrade of a route that connects Nairobi to the industrial town of Thika and onward to Kenya’s tea and farming heartland. Kenya is the world’s biggest exporter of black tea and supplies one-third of the flowers sold in the European Union. The freeway will be expanded to as many as 12 lanes from two. Rehabilitating the road network, which carries 80 percent of Kenya’s cargo and passenger traffic, may also curb the economic damage caused by road accidents, the country’s third-biggest killer after HIV/AIDS and malaria. At 34.4 deaths per 100,000 people, Kenya’s traffic mortality rate is the 16th highest in the world. Countries including Afghanistan, Egypt and the United Arab Emirates have higher rates, according to 2007 figures from the World Health Organization. Rob Holtrop, managing director of a 50-hectare (124-acre)calla lily farm near Limuru, 20 kilometers northwest of Nairobi, said a recently built bypass there saves him time and money. His driver, who ferries 10 metric tons of flowers each day from that farm and three neighboring ones, now spends two hours, instead of six, plying the route from Limuru to Nairobi’s international airport. Even so, he hits the road by 4 a.m. to avoid getting stuck in morning rush hour. “The improvement is 100 percent; it has really lowered our shipping costs,” Holtrop said in a phone interview. 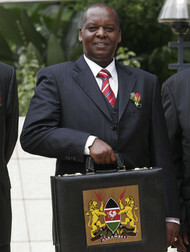 Road expansion accelerated after President Mwai Kibaki, a former finance minister, was elected in 2002. He pledged to fix transportation bottlenecks, end power shortages and enact changes that have drawn private investment and interest from donors including the African Development Bank, the World Bank,China, Japan and the European Union. “It is difficult to be competitive if you cannot move your goods or raw materials around cheaply,” Bob Okello, a Nairobi-based spokesman for Coca-Cola, said in an e-mailed response to questions. Improvements to Kenya’s transport network over the past seven years reduced vehicle breakdowns by 5 percent and led to a 10 percent savings on fuel costs, he said. Nairobi, Africa’s 12th-largest city with a population of 3 million, has grown from its founding in 1899 as a supply depot along the railway from Mombasa, on Kenya’s southern coast, to Kampala, the capital of neighboring Uganda. 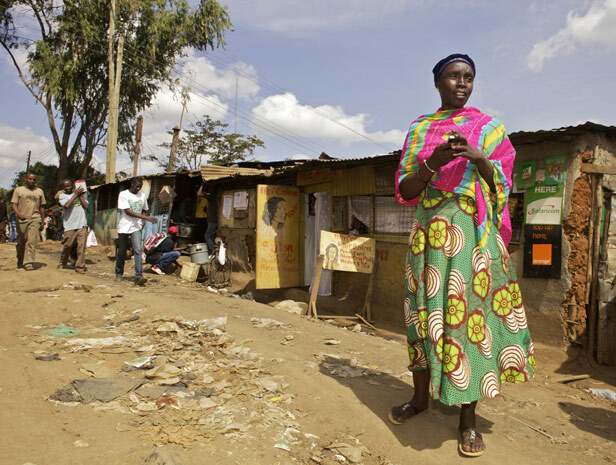 Rapid urbanization spurred by migrants seeking jobs in a city that generates as much as 60 percent of the country’s gross domestic product may push Nairobi’s population to 5 million by 2020, according to the World Bank. The current road network is only adequate for a city a 10th of its size, according to the United Nations’ Human Settlements Programme. Improved transport links in and around Nairobi mean “we will be able to reach more of our customers and farmers,”Caesar Mwangi, managing director of Sasini Ltd. (STCL), Kenya’s largest publicly traded tea and coffee grower, said in an interview. Apart from the central business district, Nairobi has few working traffic lights and police officers direct vehicles at the busy junctions. The city’s mass transit system is comprised mainly of privately owned minibuses, known as matatus, whose drivers routinely flout traffic safety laws. The Thika freeway, being built by three Chinese engineering contractors, including Sinohydro Group Ltd. (601669), is running a year behind schedule and is expected to be completed in July. International Business Machines Corp. (IBM) expects infrastructure development to help Nairobi improve its ranking on the so-called IBM Global Commuter Pain Survey. The report, which measures the toll traffic takes on work, family and health, showed the city is the world’s fourth-worst for workplace commuting, after Mexico City, Shenzen and Beijing. However, RTE sources have rejected this outright, saying that expert translators were used at all stages, and each translation was verified a number of times. They also said that there was “no doubt” among the investigative team that she fully understood what she was being asked. A Mudi family source last night said the whole issue has “brought shame” on them. They claimed she “misinterpreted” the questions which were being asked of her by the Prime Time Investigates team and did not fully realise their implications. Last May, the Prime Time programme falsely accused Galway priest Fr Kevin Reynolds of fathering a child in Kenya with Veneranda 30 years ago. Fr Reynolds strongly denied the allegation from the outset, but the programme was aired and Fr Reynolds temporarily stepped aside from ministry. After a DNA test confirmed he was not the father, RTE apologised to the priest and accepted the allegations were baseless and untrue. Fr Reynolds was awarded undisclosed damages by the High Court and received an apology. Last night a Mudi family member said the rumours that Veneranda’s daughter Sheila was fathered by a white man began when she was a baby because her skin tone was much lighter than her mother’s. “There were rumours (locally) and that grew into something people believed,” he said last night. He said Veneranda is “not happy” with what has happened — but she also blames herself and her lack of education as she doesn’t speak English. “She is also blaming herself for not going to school, she didn’t understand everything. But a well placed source said last night that Veneranda was interviewed by the RTE team a number of times and verified her story each time. It was also translated and checked a number of times, they said. RTE is due to respond next week to a report which was carried out by the BAI on the orders of Communications Minister Pat Rabbitte. Yesterday the broadcaster said it was “disappointed” that the report was leaked “and prejudices the response of the programme-makers as named individuals”. “If fair regulatory procedures are to apply, RTÉ and the production team must be allowed to make submissions to the BAI in response to the report, within the process,” a statement said. Last week RTE announced the managing director of RTE at the time the programme was aired, Ed Mulhall, is to retire, while Ken O’Shea resigned from his post as editor of current affairs and will be transferred to an assignment in television. Executive producer Brian Pairceir and reporter Aoife Kavanagh are currently not involved in any on-air programming. RTE has also axed the award-winning series.
. “Things were poorly done,” the family member said, adding that it was a poor investigation. “They should be ashamed of themselves. I’d like to know the person who started this story.” An RTE spokesman last night said that they were precluded from commenting on the production of the programme until the BAI investigation was completed. We met Peggoty Mutai in Paris in March of 2012. She was one of 15 scientists whose research projects were selected by the “L’Oréal-Unesco For Women in Science” programme, earning them an International Fellowship. 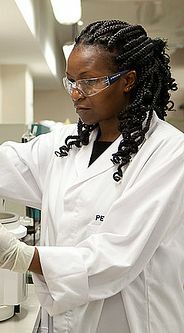 A PhD student in Chemistry, Peggoty Mutai plans to find new treatments for parasitic worms. I grew up in Kenya, in a small town called Kericho. It was exciting running around. I was interested in nature. When I went to school, I was excited by science experiments. So I wanted to do something about chemistry. A high percentage of children in Kenya suffer from worms. Growing up, we were never tested. We grew up with them. Children cannot achieve their full potential this way. There are dewormings nowadays : all children from a school are given medicine against worms. This results in less abstention from school. But what happens when it stops working, when worms develop resistance ? In Kenya, many people are using traditional medicine with plants. We study the effect of these plants. To test them, we have been using so far an inefficient system, analyzing sheep feces. The focus of my work is on taking proteins (*) from worms and putting them in… yeast! Everything is done in the lab now. When we get good compounds, we can test them on the sheep. It is more efficient. Are you collaborating with other scientists? You cannot be good at everything, science is about a team collaborating towards a common goal. Do you have a message for the women of Africa? I am a woman in science. Science has a lot to offer to women, opportunities. All women practice science at some point in their life, e.g. cooking is a science! Science is challenging -nothing is easy in life- but it is interesting. Women should not fear it or run away from it. How long until you and your colleagues find a cure for worms? It could take three or thirty years. That’s why it’s called research!